Document No 3894: ON BOARD THE PURITAN - "MUZZLING THE JIB-TOPSAIL." Genuine antique double page engraving titled, ON BOARD TEH PURITAN - "MUZZLING THE JIB-TOPSAIL." - drawn by J.O. Davidson. Article concerning is included. 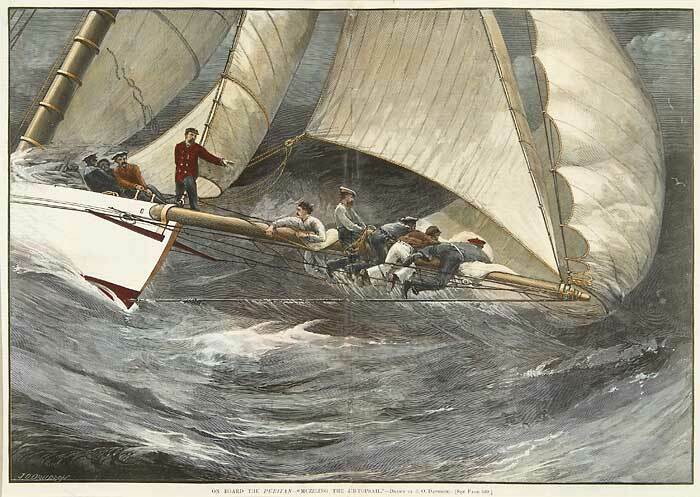 Puritan was the America's Cup Defender who beat the Priscilla and later the Genesta. Published in "Harper's Weekly" Sept. 12, 1885. It is a dated sheet. Dimensions in inches, 15 1/2 x 21.